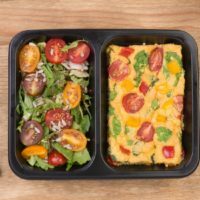 Home » Healthy Living » Is It OK to Skip Lunch? Eating lunch is just as essential to energy levels for breakfast. Learn why! We always hear that breakfast is the most important meal of the day, but what about lunch? Lunch is easy to put off during those busy work days, when parenting or while you’re in the midst of conquering a forever-to-do list! There may even be days when you only get in two bites before you’re distracted and find yourself famished right before dinner. Just like with breakfast, many people think that skipping lunch may seem harmless, but if it becomes the norm, then it can negatively affect your health- mentally and physically. Whether you simply lose track of time or don’t realize you’re hungry until you’re famished – skipping lunch happens to the best of us! If you find yourself leaving out lunch on a regular basis or you’re just not doing a good job of planning for something healthy, you might find yourself often grabbing unhealthier options such as candy bars, chips and whatever is at the vending machine. Let’s dive into reasons to eat lunch and how to get ahead of the insatiable hunger before it starts! Add it to your to-do list. At first, this may seem to just make your to-do list longer, but over time it will become part of your routine, and you’ll feel great crossing it off the list every day! Prepare food on Sunday that you can portion out for at least three lunches that week. Make a list of healthy go-to take-out options. When you place an order, you can order an extra dish, or save leftovers from dinner for lunch the next day. Keep wholesome snacks available. If you are running late for lunch, this will keep you from crashing and reaching for junk! Think whole grain crackers, dried fruit, non-fat Greek yogurt, low-fat cheese sticks, homemade trail mix, or even a spoonful of peanut butter with some fruit! Hydrate healthy and stay away from beverages with added sugars! Try making your own fruit and herb infused water and pair it with a piece of fruit or crackers instead. Comment on Is It OK to Skip Lunch?